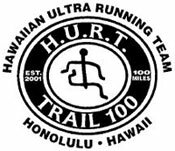 There is an endurance race in Honolulu, Hawaii appropriately called the H.U.R.T 100. The race is hosted by the Hawaiian Ultra Running Team, is 100 miles long, and allows a maximum of 100 competitors. This year the eighth annual race was run on January 19 and 20 (the same race, keep in mind - it's that long). Of the 100 highly-conditioned entrants, only 24 finished the race. The runners started out early Saturday morning, running all day, all night, and were required to finish by 6:00pm on Sunday. The route went from Makiki to Nuuanu and back five times. "Well, for like this weekend because of rain and stuff, the course is really nasty. The routes are slippery, the rocks are slippery, the mud is deep. I mean, look, it's a really, really hard course." "This is the ultimate right here. This is the ultimate. The ultimate trail race." "This is the hardest one of all of them. We trained in these mountains for twenty five years, my club, the Hawaiian Ultra Running Team, and we decided to make something very very difficult." "The elevation gain is the most difficult. Each runner gains a total of 27,000 feet over the course, so he runs up the equivalent Mount Everest in about 30 hours." I can't even stay awake for 27+ hours!